While definitions of investigative reporting vary, among professional journalism groups there is broad agreement of its major components: systematic, in-depth, and original research and reporting, often involving the unearthing of secrets. Others note that its practice often involves heavy use of public records and data, with a focus on social justice and accountability. For our companion video, “What Is Investigative Journalism,” check GIJN’s YouTube channel. Some journalists, in fact, claim that all reporting is investigative reporting. There is some truth to this—investigative techniques are used widely by beat journalists on deadline as well as by “I-team” members with weeks to work on a story. But investigative journalism is broader than this–it is a set of methodologies that are a craft, and it can take years to master. A look at stories that win top awards for investigative journalism attests to the high standards of research and reporting that the profession aspires to: in-depth inquiries that painstakingly track looted public funds, abuse of power, environmental degradation, health scandals, and more. Sometimes called enterprise, in-depth, or project reporting, investigative journalism should not be confused with what has been dubbed “leak journalism”–quick-hit scoops gained by the leaking of documents or tips, typically by those in political power. Indeed, in emerging democracies, the definition can be rather vague, and stories are often labeled investigative reporting simply if they are critical or involve leaked records. Stories that focus on crime or corruption, analysis, or even outright opinion pieces may similarly be mislabeled as investigative reporting. 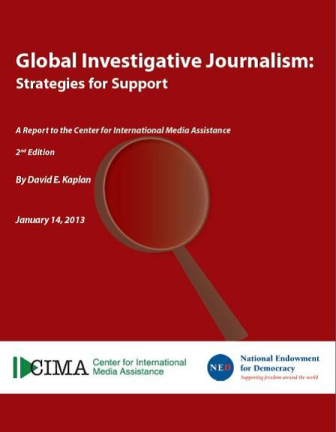 Excerpted from Global Investigative Journalism: Strategies for Support, David E. Kaplan, Center for International Media Assistance, 2013. Kaplan is executive director of the Global Investigative Journalism Network, an association of 155 nonprofit groups in 68 countries that work to support investigative reporting.